The Investment Management team round-up some of this week’s news. UK inflation as measured by the Consumer Price Index (CPI) was released this week, up from 0.6% in August to 1% for September – the greatest month-on-month increase since June 2014, the highest level in almost two years. However, the Office for National Statistics has emphasised that it is “low by historic standards”. Many economists are expecting inflation to peak at between 3-4% in 2018. 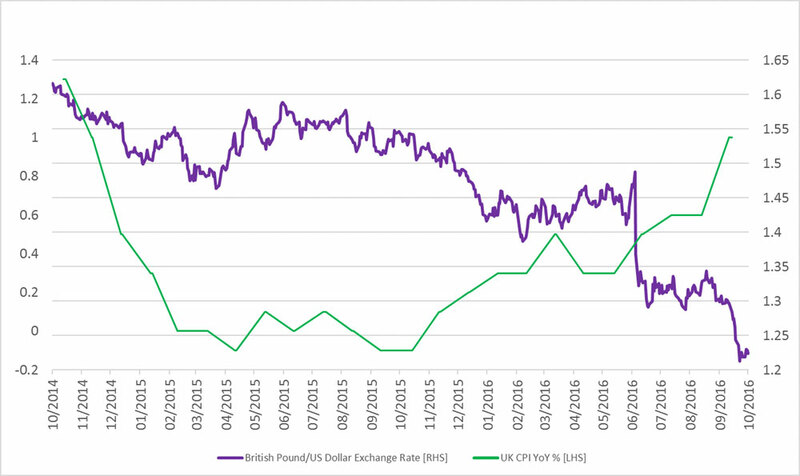 One of the main factors behind this inflation increase may be due to the weakening of the pound, which has fallen around 18% since the UK voted to leave the European Union in June. Bank of England (BoE) officials warned that this decline in the pound will probably push inflation above the BoE’s 2% inflation target. There are concerns amongst trading partners that further price rises may hit living standards hard next year. The impact of upward pressures on prices was recently reflected in last week’s spat between Unilever and Tesco over the prices of food and other consumer goods – the most visible effects of Britain’s decision to leave the EU. Economists have noted that while sterling’s weakness has yet to show up in higher prices across the board, the effects are clear in goods such as petrol and diesel. The consequences of inflation depend on how much further prices have to rise, whether wages also go up in tandem and how the Bank of England responds. For cash savers the unfortunate reality of low interest rates and rising inflation is the value of their capital is eroded. If inflation rises between 2-3% and interest rates don’t rise, a £10,000 investment could be worth £8,600 in real terms in five years. Whilst Bonds which offer a fixed coupon also becomes less attractive, there are some asset classes which can serve investors well in a rising inflation environment such as inflation-linked bonds (where the coupon adjusts for the rise in inflation) and other investments such as gold, property and infrastructure tend to perform well. One recently discussed topic in the news this week has been whether Mario Draghi, European Central Bank (ECB) President, will confirm or deny rumours of tapering or in other words, reducing the amount of money the ECB is currently feeding into the economy. Before the meeting the consensus was that no ‘taper-tantrum’ would be announced. Despite the optimistic views of many analysts on Europe, the ECB will be facing two near-term risks: the Italian constitutional referendum, and Brexit negotiations. The meeting on Thursday left the benchmark interest rate unchanged at 0.0% and kept the asset purchase programme at 80 billion euros per month. Draghi has confirmed that the quantitative easing (QE) program will run through to March 2017 or longer, if needed. As predicted, the ECB has not changed any of the rates, nor indicated any signs of the tapering stages of QE. In addition, Draghi commented that the policy is becoming more and more effective, and that corporate-bond issuance increased markedly. The day after Draghi signalled no end to QE yet, the euro fell to its lowest level since March to $1.0909.